For such “experts” the idea that ordinary American’s could have voted for a chauvinistic, misogynistic and demagogic racist as opposed to a what the media bubble perceived was Clinton’s modern liberal and humanist values and sense of dynastic self-entitlement, was inconceivable. 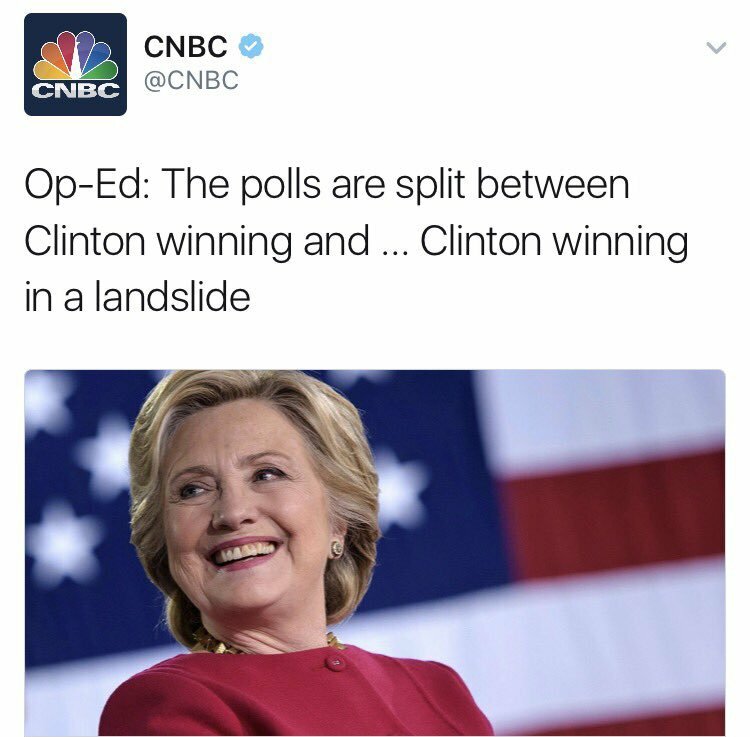 The pollsters who were wrong about the 2015 UK general election, the EU Referendum and Corbyn’s election victory, predicted with near unanimity that Clinton would win as illustrated by CNBC in the graphic below. The “expert” views above were largely predicated on what the polls were telling them. In view of the pollsters latest debacle, it must be increasingly obvious to the public that the purpose of the metropolitan media elite’s use of polls – which as Mark J Doran pointed out – “are expensive and have no shelf-life” – is to influence, rather than reflect, public opinion. The notion that Trump’s flamboyant and largely inflammatory campaign was directed at a disillusioned, disenfranchised and alienated working class, while Clinton’s rather lackluster and robotic campaign was aimed towards a corporate-media elite, appeared to be beyond the understanding of the liberal-left broadsheets. Jonathan Freedland’s piece for the Guardian entitled, Who is to blame for this awful election?, for example, was written as if he had just ventured to earth from another planet. At no point did Freedland make reference to Clinton’s complicit role in the destruction of Libya, the dismembering of Syria, her role in Honduras or the comments she made in relation to Palestinian elections. Neither, did he mention the disastrous domestic economic policies of the Obama administration and its fetishizing of neoliberalism, or the wider ratcheting-up by the establishment of anti-Russian propaganda. Instead, the politics of identity were preferred. It appeared to be beyond the comprehension of the Guardian journalist that one of the main reasons why the American people voted Trump into power was that the failed economic policies of his predecessors over the last two decades, have resulted in a fall in their incomes, while those at the top have increased. Krugman’s tweet was a clear slur on all those who had the temerity to vote on principle for a candidate who was closer in ideology and policy to Sanders than Clinton. This is important. The Democratic National Committee rigged the election against Bernie Sanders in order to ensure their favoured candidate, Clinton, would win. I’m almost certain that had Sanders run against Trump he would have won the race to the White House. So its somewhat rich for a Clinton supporter to be critical of people for voting for a third candidate on the basis that it split the Clinton vote. There’s an argument to be had whether there’s a core element among Trump’s supporters motivated by the racist sentiments and crass economic nationalism expressed by the president-elect. It’s also legitimate to acknowledge the anti-intellectualism and ‘post-truth’ nature of modern society in which major grievances are embodied, for example, in the comments of Michael Gove and the public’s reaction to the High Court judgement regarding Brexit. But this is vastly overshadowed by the real socioeconomic concerns of the mass of working people in terms of the race towards the lowest wages, employment rights and working conditions in an era of neoliberal globalization. It’s this failure to understand that contributes enormously to the rise of right-wing populist movements of which Trump’s electoral success exemplifies. The gap between what elite political commentators believe is credible on the one hand, and the reality on the ground on the other, is enormous. Unless this gap closes, corporate newspaper sales will continue to decline. With declining readership comes falling advertising revenues which means more newspapers going to the wall in the months and years ahead. Good article. We should be grateful to Trump for shattering the Democrat machinery which traded peace, honesty- and Sanders- for corporate greed, destruction and dynastic delusion. Then, as soon as he actually offends our humanity, we should act towards impeaching the bum. ‘ leads ‘ the world to annihilation. Thanks for the link May. Good work.